So you want to travel, but money is tight. Why let that stop you? From my experience, one of the biggest single expenses of travel is usually lodging. This is especially true if your goal is hiking, sight seeing, visiting state parks or some other trip where your outright goal is something other than an expensive play date (e.g. Snowboarding, skydiving, or any of the other things you probably do, right?) Even in those cases, wouldn’t it be nice to take that money you’d be spending on lodging and use it on food instead? Enter car sleeping. Before you take a road trip, and especially a long term or long distance one, you should know the accommodations for sleeping in your car, especially if Couchsurfing. Although I’ve never not gotten a couch when I requested one, there were times when I got lazy and didn’t have enough time to find a host. When I realized the luxurious accommodations my car had to offer, a whole new world of travel opened up. But what do you need to be able to comfortably sleep in a car? 1. Test out your vehicle for space and comfort. If you are in a car you can easily drop the back seats down and slide the front seats forward to make plenty of room to stretch out. Do you fit? It might not be perfectly comfortable now, but as long as there is space we’ll handle that later. 2. Have a sun shade and other ways to block your windows. The sun shade is great to cover your windshield. They also make suction cup shades that can apply to your back windows. 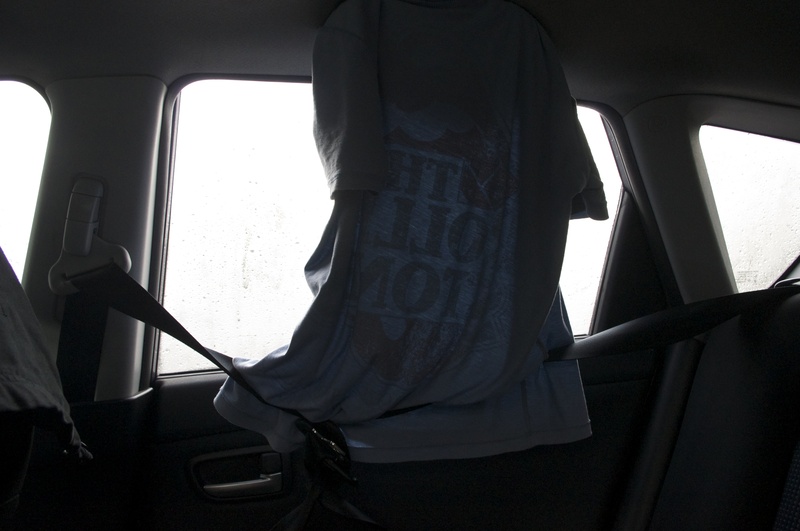 If you really want to go budget, throw a hoodie or blanket over your front seats and block the back windows with t shirts. For the back window, just stuff some bags and things on the sill below it. This will help by not only giving you privacy from passersby, but keep the light from waking you in the a.m.
3. Let’s get comfy. 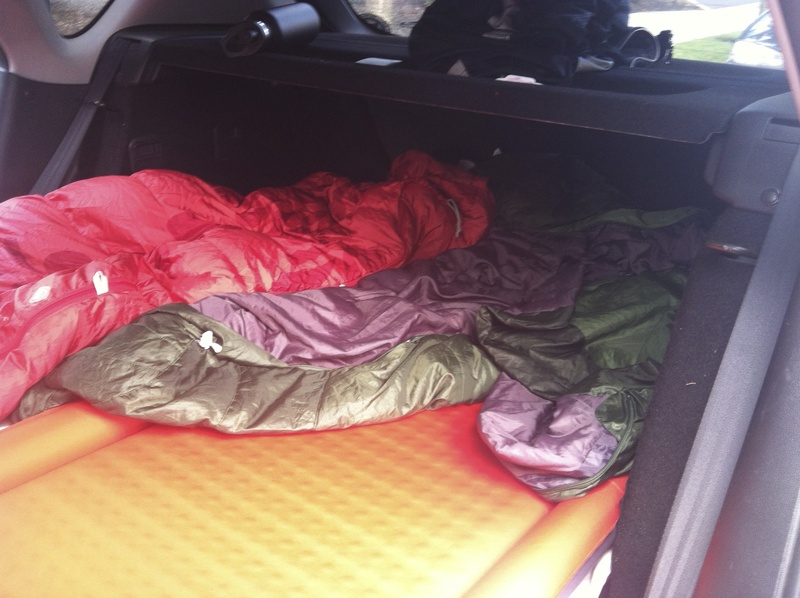 A sleeping bag and camp bed will take your car from stiff and bumpy to Hilton comfy! A decent self inflating mattress packs down nicely and makes a world of a difference. Budget alternative: layer a quilt or blanket. 4. Tetris time. Test pack everything you will be taking with you, then see if you can rearrange it to allow for sleeping. Put gear on the front seats, then push them forward. Stuff gear between the front seats and back seats. This will give more sleeping room and space to lay your head as well. Pay attention to arrangement! Ideally, you can get everything rearranged quickly so game time set up doesn’t take long or draw to much attention. So your setup works wonders and your ready to travel. Here’s what you need to know. 1. Plan your sleeping stops next to hospitals with emergency rooms. This gives you 24 hour access to bathrooms for brushing your teeth or late night water breaks. Most times an attendant won’t even question you when you walk in, but if they do just say “my brother is in a room upstairs, but first where is a restroom?” Alternatively, public parks could work, because often times they will have public restrooms that are always open, but keep your eyes open for parking restrictions. This is a good second resort for smaller towns. Even a Wal-Mart (or other 24 hour grocery or supermarket) is a good option, but beware parking restrictions. 2. Know where the closest hostel is. Most hostels offer a shower for $5. Much cheaper than a truck stop shower that can range from $8-13! In fact a great way to travel is car sleep one night, then hostel the next (if couchsurfing is not available, of course). Even if you’d rather just shack up in your car, you can at least stay clean at a hostel. 3. Park wisely. Car sleeping is not always an acceptable practice, so use common sense. First off, you want to keep from drawing much attention to yourself, secondly, you want to have a good nights rest. So while parking a street over from the hospital in a really quite neighborhood might seem best for your sleep, it might also draw too much attention. And if you are parking in a hospital parking lot (and are lucky enough to find one without parking restrictions), its a good idea to park in a semi trafficked area so that you are not totally standing out when preparing to wind down. Obviously you need to keep an eye out for towing zones, and signs that say “No Overnight Sleeping In Cars” or similar (although that last one should be assessed based on surroundings. I have ignored the sign before and wound up just fine). Be aware of your surroundings before beginning the pre-sleep prep. 4. Have plenty of water on hand. You still want to be able to brush your teeth and wash your hands when necessary. 5. Be a shameless pioneer. Don’t worry about avoiding onlookers. If there are any, they won’t really know what’s going on anyway, especially the next morning. The biggest downside to car sleeping is that for most cars you can fit at most two people. And hey, it’s not the highest standard of living, but neither is camping, and most of us are just fine with that. 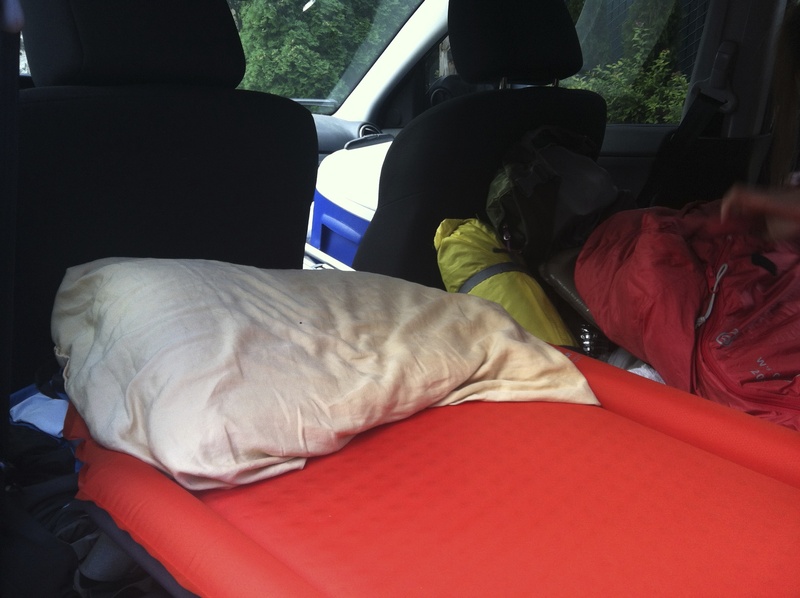 In fact, car sleeping is just like sleeping in a tent, except you’re not paying for a campsite. 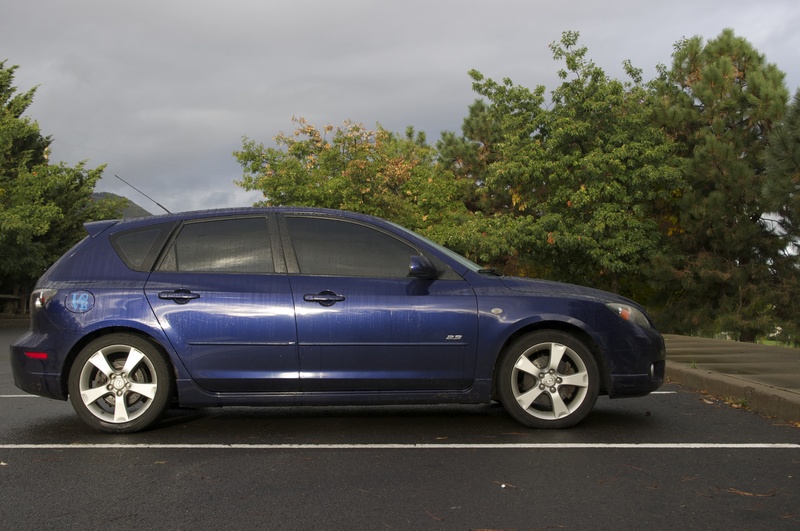 Car sleeping is not for everyone, but for those who are interested in long term travel and still have a budget to adhere to, it could be the difference between sleeping comfortably and eating well that day. Why not choose both? 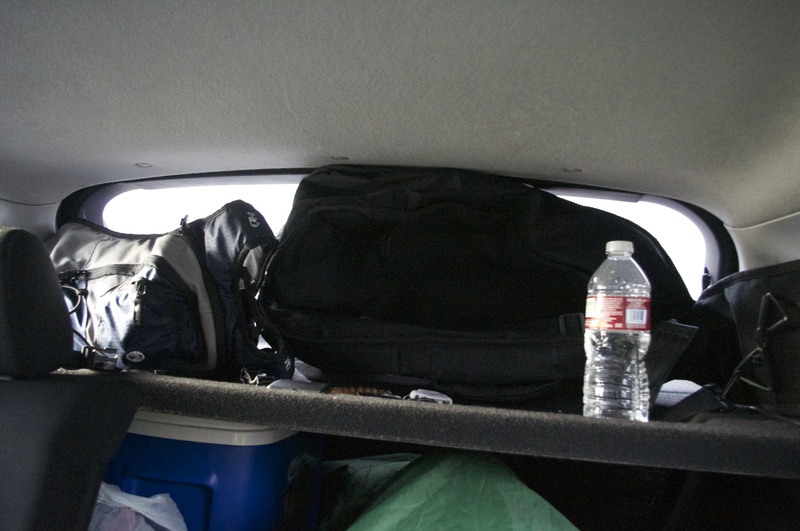 When hostels regularly cost $20-40 a night, car sleeping can add many days and many miles to your next road trip. The nice thing is, you don’t have to do it every night, but you can still choose to break up camping, couchsurfing, and hostels with a few nights of car sleeping here and there. It all depends on how far your willing to go. Did I leave anything out that you’d like to know more about? Do you have anything to add? Leave your questions and contributions in the comments below!